Rooibos tea has landed on western shores with much fanfare. This traditional South African beverage delights the senses with a delightful red hue and blend of sweet and malty flavor. It features a bold flavor profile that entices taste buds and completes the experience with a smooth or crisp finish. Rooibos tea, pronounced ROY-boss, is revered on the African continent. It hails from a small, mountainous region where it have been consumed for its health benefits for centuries. Find out more about this exotic red tea and check out our fun recipes to incorporate it into your tea repertoire. Rooibos tea is native to Africa, where it has been harvested there for more than 300 years. The rooibos plant grows exclusively in the mountainous Cederberg region of South Africa. 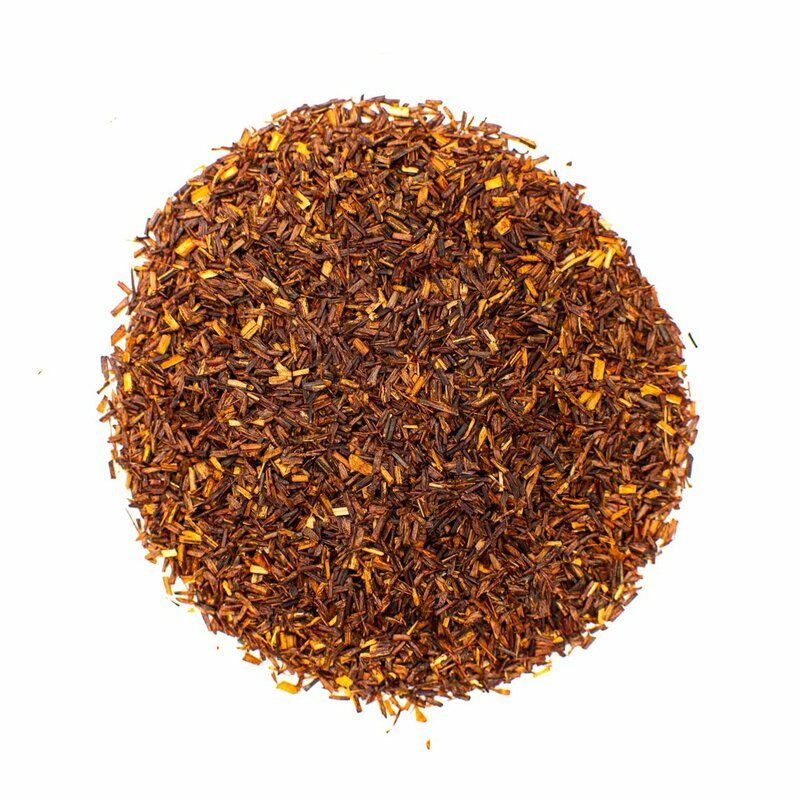 Rooibos tea is commonly called 'red bush tea' or 'bush tea' in the western world, particularly in London. 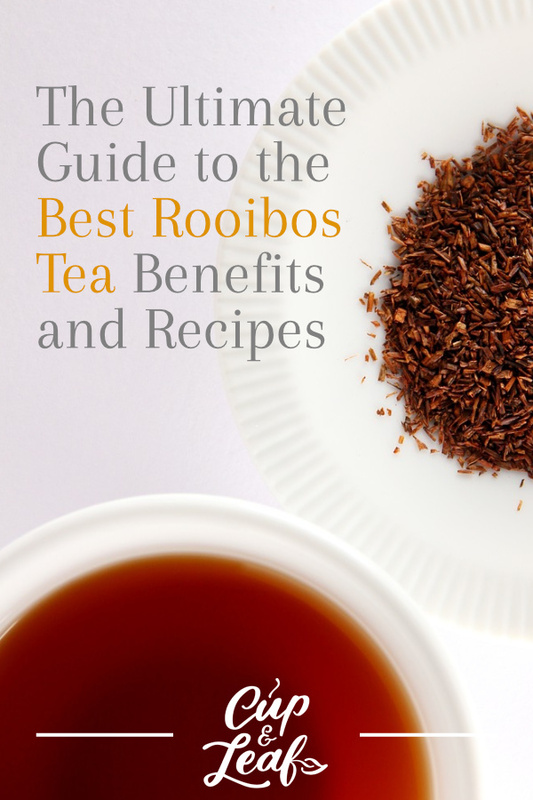 The term 'rooibos' has been legally protected in South Africa since 2013. Teas may only be labeled as 'rooibos tea' if the leaves come directly from the Aspalathus linearis plant. 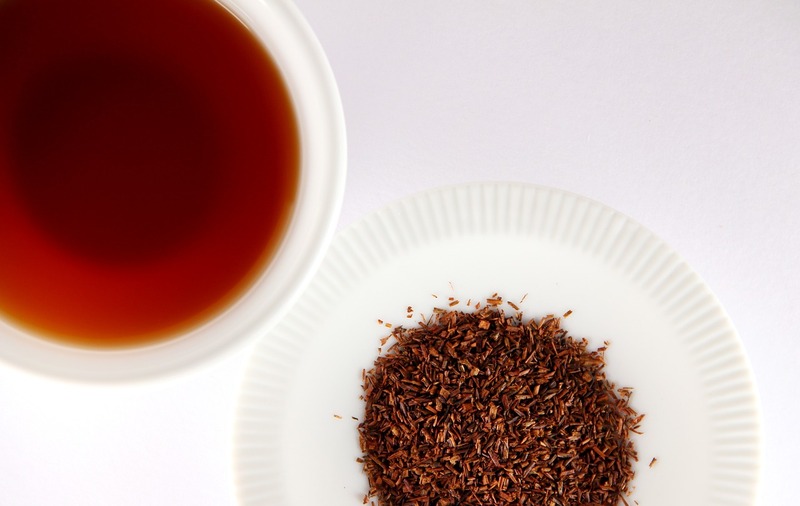 There are two main types of rooibos tea: red rooibos and green rooibos. Both varieties come from the red bush plant, but undergo different production methods. ‍Red rooibos tea leaves are harvested and oxidized to produce a rich, maroon color. Red rooibos is often referred to as original or traditional rooibos. Green rooibos leaves are not oxidized and undergo a production process similar to green tea. The leaves are harvested and dried to prevent oxidation. They are then sorted and graded for sale. Rooibos teas are graded based on the ratio of bush leaves to stems in each batch. 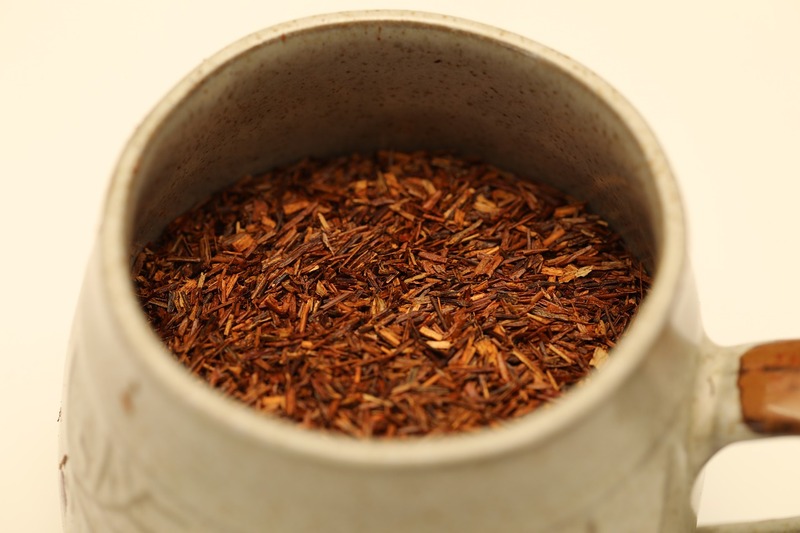 The highest quality rooibos teas contain mainly leaves. Rooibos teas with a higher concentration of leaves tend to have a richer flavor, smoother aftertaste, and are darker in color. Red rooibos tea features a flavor profile and color that is similar to hibiscus tea. It boasts floral notes, a slightly tart finish, and is deep red or light brown in color. Tea masters meticulously control the oxidation process of red rooibos to elicit certain flavors. Depending on the length of oxidation, red rooibos can feature smoky, sweet, or woody flavor profiles. They can also have hints of honey, geranium, caramel, and vanilla. Green rooibos tea has a maltier flavor profile than red rooibos versions. It features grassy notes with a crisp finish. Green rooibos teas are considered lighter, but more full-bodied than red rooibos teas. Rooibos tea is naturally caffeine-free, making it an ideal choice as a base tea for flavored and herbal teas. This red tea is commonly used as a replacement for black tea in masala chai for people who want to limit their caffeine intake. Rooibos tea contains high concentrations of antioxidants and polyphenols that boast a range of health benefits. Polyphenols have been shown to protect brain health and may help prevent cardiovascular diseases (1). Red tea rooibos may also help streamline digestion and improve weight loss (2). Rooibos helps to induce calm and decrease the stress hormone cortisol, which has been connected to stress eating. Drinking rooibos tea before a meal may help reduce feelings of hunger and prevent overeating. Rooibos also contains nutrients that help support immune health. The aroma of rooibos tea works as a bronchodilator that helps to reduce chest congestion and coughing caused by allergies and the common cold. South African rooibos tea may also increase estrogenic activity. For this reason, it's important to consult with your physician before drinking rooibos if you are pregnant or breastfeeding. 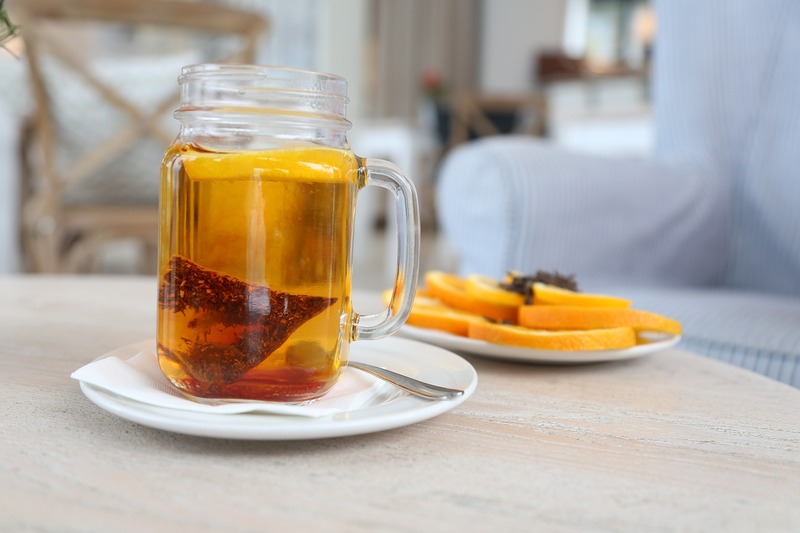 Try our Organic Rooibos Tea to live healthier and happier with each cuppa. Rooibos tea also contains anti-inflammatory properties that can help promote overall health. Free radicals from smoking, environmental pollution, and unhealthy diets can wreak havoc in the body. Excess free radicals can trigger inflammation and oxidative stress, which break down normal cellular processeshelps to reduce this inflammation and eliminate free radicals to keep your body at peak performance. To reap these health benefits, it's best to purchase USDA certified organic red bush tea. Non-GMO teas ensure the tea you drink is organically grown and free from harmful chemicals that can have nasty side effects. There are also several fair trade certified tea brands that produce organic red tea rooibos including Twinings and Davidson's Organics. We always recommend opting for loose leaf tea instead of tea bags. That's because loose leaf teas contain the full leaves of the red bush plant and thus all the healthy nutrients and compounds. Loose tea also produces better flavor and a more immersive tea drinking experience. Tagless tea bags may be convenient, but their restricted packaging doesn’t allow the leaves to fully expand and infuse flavor. These types of tea tend to be dull compared to loose tea varieties. Grab a bag of pure rooibos loose leaf tea and enjoy this South African cultural wonder. Rooibos tea is easy to brew and its hardy nature means you don't have to worry about astringent flavors like you do with some true teas. 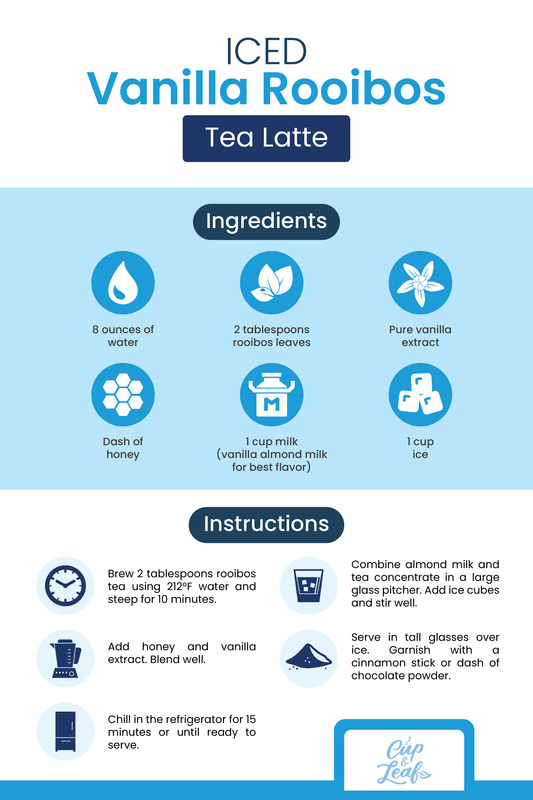 This beverage is often prepared similarly to black tea with a dash of milk and sugar or honey. It can also be consumed as an iced tea, espresso, or latte. 1. Bring 8 ounces of water to 212 F using a tea kettle or stovetop pot. 2. Add 2 teaspoons of rooibos organic tea to a tea ball or infuser. Place in tea cup and add hot water. 3. Steep for 5 to 6 minutes. Rooibos tea is a hardy blend and can steep for up to 12 minutes for stronger flavor. This South African red tea does not develop bitter flavors when brewed with hot water or for long periods of time. 4. Drink as is or sweeten with a slice of lemon, maple syrup, honey, or milk of choice. Enjoy! 1. Brew rooibos tea according to traditional method above. Steep for 10 minutes. 2. Add honey and vanilla extract. Blend well. 3. Chill in the refrigerator for 15 minutes or until ready to serve. 4. Combine almond milk and tea concentrate in a large glass pitcher. Add ice cubes and stir well. 4. Serve in tall glasses over ice. Garnish with a cinnamon stick or dash of chocolate powder. 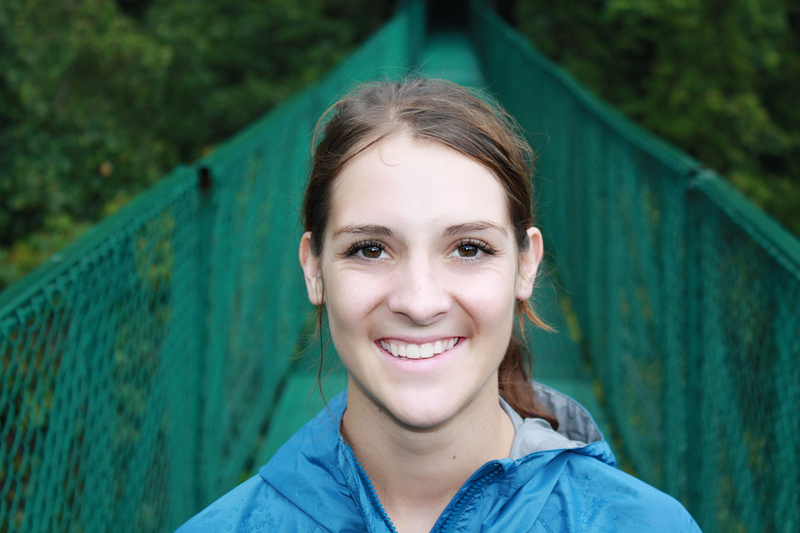 Looking for a shortcut? 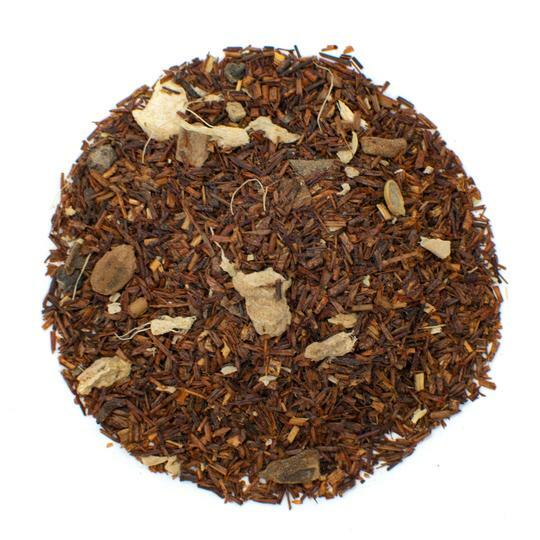 Try our Rooibos Masala Chai. It's the perfect blend of chai spices and red bush leaves. 1. Grind all the spices using a spice grinder or stone mortar and pestle. You can also use ground spices to save time. 2. Add spices and water to a large pan on the stove and bring to a rapid boil. 3. Toss in rooibos tea leaves and allow to simmer for 20 minutes on medium low heat. 4. Strain into a tea cup using a fine mesh strainer. 5. Add a cinnamon stick for garnish and enjoy! 1. Start by brewing rooibos tea according to the traditional method. 2. Combine the tea, fruit juice, and vodka in a large glass pitcher. Stir well. 3. Serve over ice and garnish with an umbrella or a few slices of fruit. Rooibos tea offers two distinct flavor profiles that are sure to please most palettes. Pure rooibos red tea is a visually pleasing tea that tastes sumptuous. It's vibrant red color draws in your senses and its floral, tart flavors seal the deal. Green rooibos tea is a great option if you prefer richer flavors. This blend features a malty profile that is similar to yerba mate. Drinking rooibos tea can also be good for your health. Its high concentration of antioxidants helps boost your immune system and keep you healthy. Try out the traditional brewing recipe or get creative with one of our other recipes. Whichever flavor profile you prefer, rooibos is an excellent addition to your cupboard.